Two and half years ago one of my biggest dreams had come true; I was so happy and extremely proud when my healthy and beautiful baby boy was born. My husband and I had been waiting and preparing the best we could for this exact moment for a long time and we were finally ready. My baby was perfect; beautiful, big, had a full head of hair already, had 10 fingers and toes, and alert from the first moment we met. 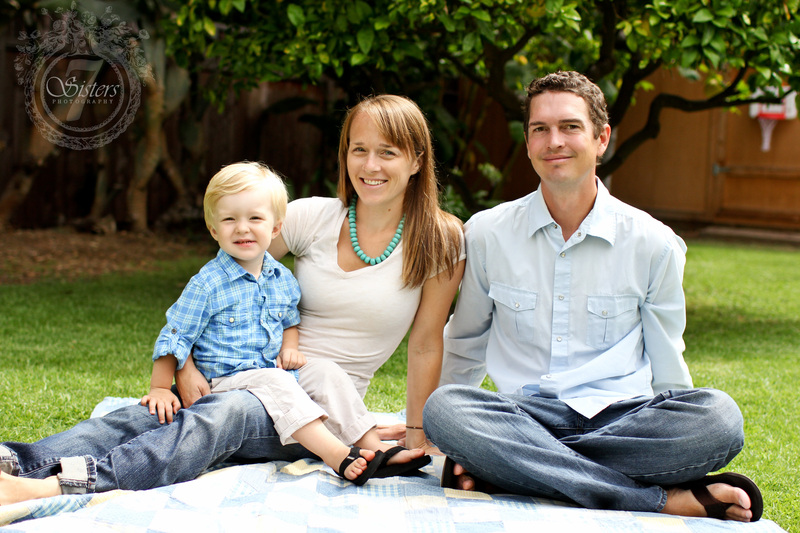 This being our first baby it took us a while to understand each other’s needs as I recovered from my Cesarian section and immediately started breast feeding, but within a few weeks we were perfectly in sync and in pure bliss. Being a mom was amazing and I immediately knew why I was put on this earth; to be Keenan’s mommy. When I look back at those first few weeks, the only clue we had that our life would soon be shocked to the core was a white spot/ birthmark on his knee that our pediatrician had waved off as no big deal. We quickly began the newborn pattern of the day filled with eating, sleeping, and pooping; we thought everything was perfectly normal. Where our story is slightly different then a lot of others lies within the next 18 months. We lived the next 18 months as a normal, healthy, happy new family. Keenan hit milestones on time and was a constant thrill to watch him cognitively advance and become a little person. We were doing perfect and beginning to plan for a sibling for Keenan in the future. Then at 19 months old Keenan spiked his first high fever which caused a “febrile seizure.” Witnessing that was what I thought would be the scariest moment of my life. We called 911, had our first ambulance ride, and by the time we got to the hospital everything had settled down. We were told Keenan had just had a febrile seizure which was explained to us as “no big deal” and “some kids are just susceptible to this, but they eventually grow out of it.” Next time, “just remain calm, then when it stops bring him in afterward”, “they can last up to 15 minutes, but just try to remain calm.” We were told this is common (we even saw another baby come in after a febrile seizure while we were there), we were told how to avoid fever spikes and seizures in the future with high doses of Advil and Tylenol, and then sent home. Proud of how my husband and I handled this emergency and what we thought might be our biggest challenge, we went on with our lives. I researched what I could and tried not to worry too much, till six weeks later when Keenan had another fever. With this fever I was ready with alarms for meds throughout the night but didn’t need them because I didn’t sleep at all and just watched him through the night like a hawk. He had made it through the night without a problem so I went to work in the morning and left Keenan in my husband’s capable hands. I’ll never forget at 10 am when I was finally able to check my cell phone and saw that I had five missed calls from my husband. Listening to the voicemails confirmed my worst fears, I could hear my husband saying, “it’s ok Keenan, daddy’s here.” My heart dropped because I knew Keenan was having a seizure. I called my husband quickly to find out what hospital to meet him at, and to my surprise he hadn’t called 911 yet, now realizing he was following the ER doctors instructions and he was following perfectly, “waiting it out.” My mama gut came screaming out and told him to call 911, and he did. When the paramedics had arrived he had been seizing for over 20 minutes and they had to sedate him to stop the seizure. Looking back, our first mistake was listening to the ER doctor. My son had experienced a status event. We sat in shock for the next two weeks, researching what we could (but the internet scared us to death) and making many specialist doctor appointments. We heard many grim possibilities, but the scariest we heard was that “how this disease will affect your son can not be predicted” and it’s all about dealing with one symptom at a time as they pop up for the rest of his life. Keenan also has been diagnosed with polycystic kidney disease, has a “medium burden” of tubers in his brain, one SEGA, and multiple nodules. We now sit in the unknown trying to cherish every moment because we have no idea what the future will bring. Coming up on 1 year since Keenan’s diagnosis we have gone through three different anti-seizure meds trying to control his 4-20 seizures a day without any success, we have faced the tremendous life changing decision to make to try brain surgery on our 2 and a half year old son to try to stop the seizures, Keenan has to have MRI’s every 6 months on his brain and abdomen to watch the multiple tumors and cysts on his kidneys, and blood work every 3 months. Everything and all his tumors have to be monitored to decide when the next major decision has to be made. Sometimes we feel like we are just waiting for the next bomb to drop, but we have learned so much in this past year. The major lesson we’ve learned is to prepare for the future but live in the moment: whether it be good or bad it won’t last long. So cherish the good times and live them to the fullest! Our story begins in the spring of 2008. My husband and I had just welcomed our very first child into the world. Greyson was born a beautiful and healthy 7 lb., 10 oz. baby boy and there were no indicators at all that anything was amiss with his health other than a slight touch of jaundice. He was, and still is, such a beautiful child. We were so thankful that he was healthy. We never took it for granted. Then at two months of age, Greyson had his first round of vaccinations and subsequently developed what looked like sun spots on the tops of his thighs. The vaccinations had been administered in his thighs, though, and I was aware that the appearance of the spots might well be purely coincidental. I was far from panicked, but looking back on it, I do remember that point as being the first time I had misgivings concerning Greyson’s well-being. Things took a turn when, at approximately three months of age, Greyson started to develop a strange habit. His habit looked to me like the Moro reflex – a phenomenon that occurs when some babies are placed on their backs and respond by throwing their hands out in the air. But in Greyson’s case, this behavior kept happening at strange times, and in clusters. Close family members who witnessed the behavior or were told about it tried to tell me and my husband that it must simply be an immature nervous system, or said that “babies do all kinds of weird things.” My gut instinct, however, told me that something just wasn’t right. Then one afternoon, Greyson was lying with me in the bed and I was watching him sleep. All of a sudden it hit me: what if this behavior was a seizure? I practically ran to the computer to find out what I could about behaviors associated with infant seizures. What I found made my stomach sink into the ground. It hit me like a Mack truck that what I was seeing in Greyson was the outward manifestation of a dangerous and aggressive type of seizure called Infantile Spasms. It felt like my world was crashing around me in one split second. I have always felt that it was the hand of God in my life preparing me for what was to come that, before giving birth to Greyson, I had worked for a pediatric neurologist managing an event facility that he owned. I called him immediately on his cell phone and left him a message. What followed in the next few weeks would be a complete blur. Greyson was examined by the doctor in his office, but there was nothing that he felt he could definitively diagnose without an MRI. We scheduled the MRI and when the day came, I can say without hesitation that putting a three-month-old infant into an MRI machine was one of the scariest moments of my life. 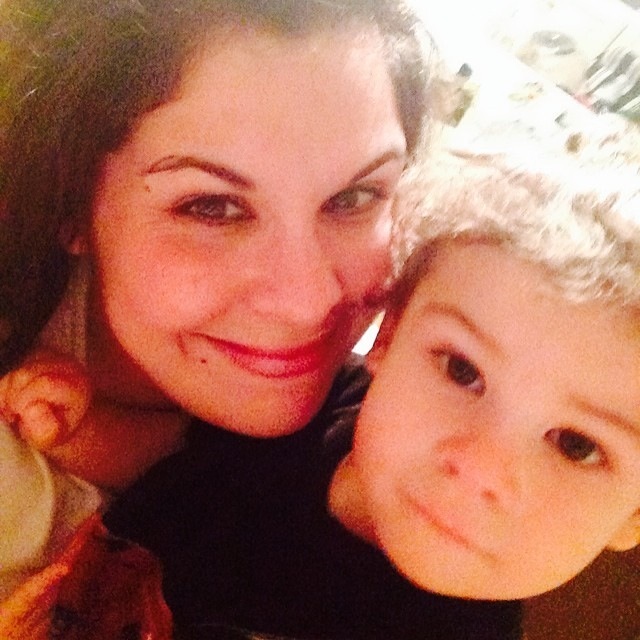 I sat in that MRI room with my baby, freezing to death, trying not crumple into a heap on the floor. After the results came back from the MRI, the doctor called me at home. He said that he saw “indications of Tuberous Sclerosis.” The doctor explained that Tuberous Sclerosis (TS) can cause epilepsy, learning disabilities and sometimes even blindness if victims develop the tuberous growths caused by the disease in their eyes (incidentally, this is the reason I feel it is so important to go directly to a TS specialist when anyone is diagnosed with TS. Though I’m thankful we got a diagnosis when we did, due to the relative rarity of TS, I was given barely a shred of information about the disease that would come to change the entire scope of our lives. The only thing I knew about TS was that my husband’s step-mother’s sister had it and she had been institutionalized for years). I looked at my precious baby lying there and suddenly was filled with fear for his future. 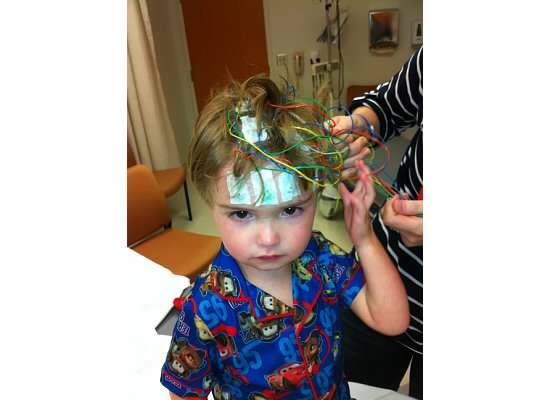 After a myriad of other diagnostic testing, including blood work, a lung x-ray, an echocardiogram, a kidney ultrasound, and several EEGs, the neurologist we had been referred to and his group came to the conclusion that Greyson’s condition was, indeed, TS. 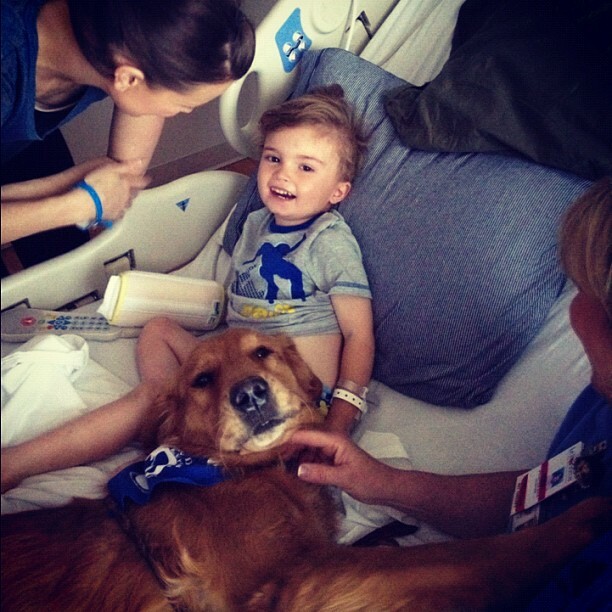 On top of that, Greyson was also diagnosed with Polycystic Kidney Disease (PKD). Because of the proximity of the genes responsible for both TS and PKD, in many cases of genetic mutation associated with TS, both of the genes deleted at the same time. They did in Greyson’s case, and our lives have not been the same since. We continued going to this same neurologist for months, even after he said ridiculous things like “I can tell when someone has TS just by looking at them,” or “don’t Google this disease,” or “I guess we can try Vigabatrin (the first line of defense against infantile spasms, which was only available through international mail order pharmacies at the time) but you will have to get it on your own from Canada,” or my favorite (from his associate): “Are you asking me if every spasm is like a bullet to the brain? No, I don’t think so.” Meanwhile, my child was suffering intensely. 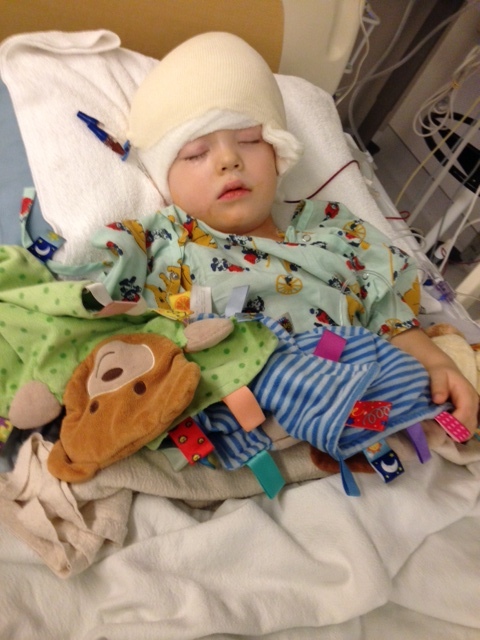 He was crying every time he had a cluster of seizures and it was heartbreaking to watch. It gives me physical pain to think of it now. At one point at around six months of age, when my child was incredibly doped up on Phenobarbital and ACTH for his seizures, and bloated to an unrecognizable state, I broke (I am not even going to mention the horror of sticking my child with a needle twice a day). 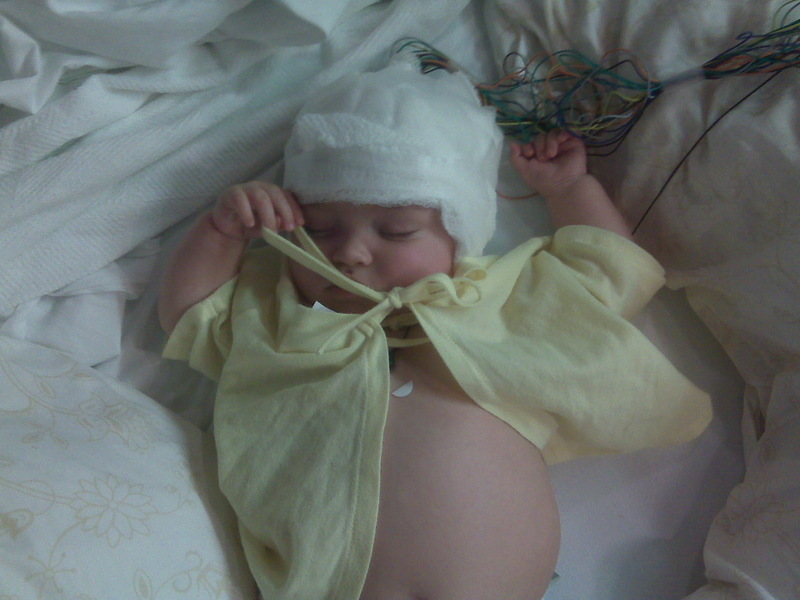 I just couldn’t take the stress anymore and I demanded that he be admitted for a 48 hour EEG. 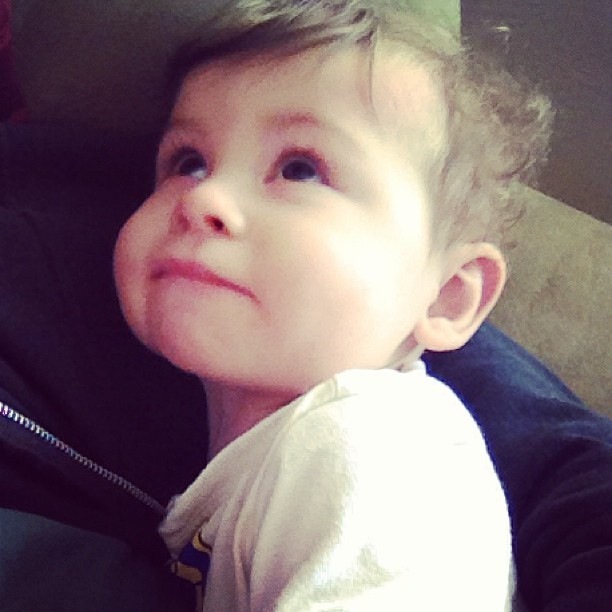 During that hospitalization, Greyson had his life saved the first time. His blood pressure was so high from the ACTH and his PKD that he had to have emergency blood pressure meds put in through an IV. He could have had a stroke at any moment. After that hospital stay, receiving no answers as to how we were going to stop Greyson’s seizures, I made up my mind that TS was not going to get the best of us, or him. I immediately researched the nearest TS clinic. At that time, in 2008, the closest clinics were in St. Louis and Nashville (we are in Memphis). My in-laws live in St. Louis, so that was the obvious choice. I begged the clinic appointment coordinator to get us in as soon as she could. When we met Dr. Wong, the head of the TS clinic in St. Louis, he put Greyson on Vigabatrin/Sabril immediately. For one entire year afterwards, we had seizure control with a combination dosage of Vigabatrin/Sabril and Topamax. After going through a huge amount of different medicine combinations, we had finally found one that worked. For that year, everything seemed like it might get better. Then, out of the blue one day in 2010 at a therapy session, the seizures started again. They didn’t stop for two years. The seizures were intense and very frequent. Sometimes, Greyson momentarily stopped breathing and often fell and hit his head. 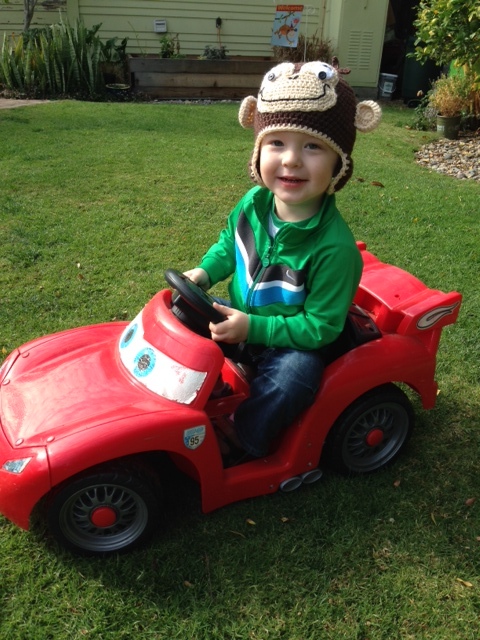 Through all this time, Grey was getting farther and farther behind his developmental milestones. 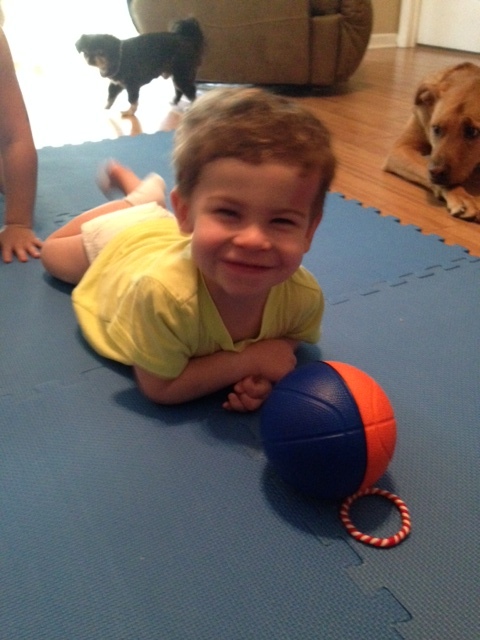 He didn’t crawl until 13 months, he didn’t walk until 21 months, and he didn’t talk until he was five. At this point, I feel I can’t stress enough how important it is to get your child into Early Intervention when he or she has TS. We scoffed at the idea at first because Grey wasn’t behind until he was close to a year old. But, looking back now I would advise any parent to go ahead and start it as soon as possible, since the TS diagnosis alone is enough for your child to automatically qualify for this free service. In any case, after failing with ACTH, Phenobarbitol, Keppra, Sabril, and Topamax, Dr. Wong was ready to pronounce Greyson’s epilepsy intractable. So, we started to think about a surgery evaluation. Around this time, I noticed that the TS Alliance had designated LeBonheur in Memphis as a TS Clinic. I was thrilled to hear this! My husband made contact with them regarding the Tennessee Step Forward to Cure TS walkathon that I have chaired for the past few years and they offered to see Greyson and give us a second opinion. This was the beginning of something amazing. Dr. Wheless, the head of the TS clinic in Memphis, and his staff at the Memphis clinic are miracle workers. I cannot say enough wonderful things about how much this man cares for his patients. One of the best things that a doctor can be is proactive and open to listening to patients and their parents. Dr. Wheless started us on the first of several medicine changes to see what would work. We went through combinations of Clobozam, Zonegran, Topamax, Depakote, and Onfi to no avail. He did more MRIs, multiple EEGs, an MEG, and a full surgical evaluation. That unfortunately told us that Grey was not a candidate for surgery, since a cluster of tubers were located in a dangerous area of the brain over the ear, where removing them could possibly do more cognitive damage than good. But Dr. Wheless stayed vigilant. As a last resort of sorts, when Greyson was four Dr. Wheless suggested that we try Sabril again. 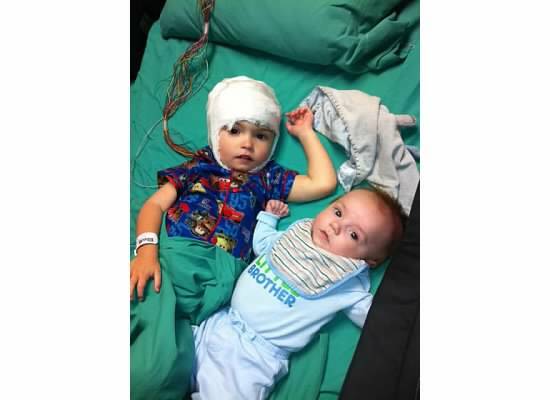 By this time, Greyson was having several seizure types including complex partials and tonics, along with myoclonics, which were the worst offenders in his case. Dr. Wheless said that there was some research indicating that Sabril was working well for complex partial seizures once a patient gets to be a little older. But, TS had something in else in store for us. The same week that Grey started taking Sabril again, he started to act like he was getting sick. We couldn’t figure out what was wrong with him because there were no outward symptoms except listlessness and extreme lethargy, and some bruising on his feet. I took him to his pediatrician and, bless her heart, she said “I don’t know what is wrong with him, but I know it is SOMETHING. I want you to take him to the ER right now.” That began the worst month of our lives and marked the second time that Greyson’s life was saved. After numerous tests and several days in the hospital, the ER doctors found that his blood work had come back with severe Leukocytopenia, which means that his body was extremely low in white blood cells. So low, in fact, that he needed a plasma transfusion. Basically, if he would have fallen and hit his head (which he did frequently with seizures and hypotonia) he could have had a brain hemorrhage and died. 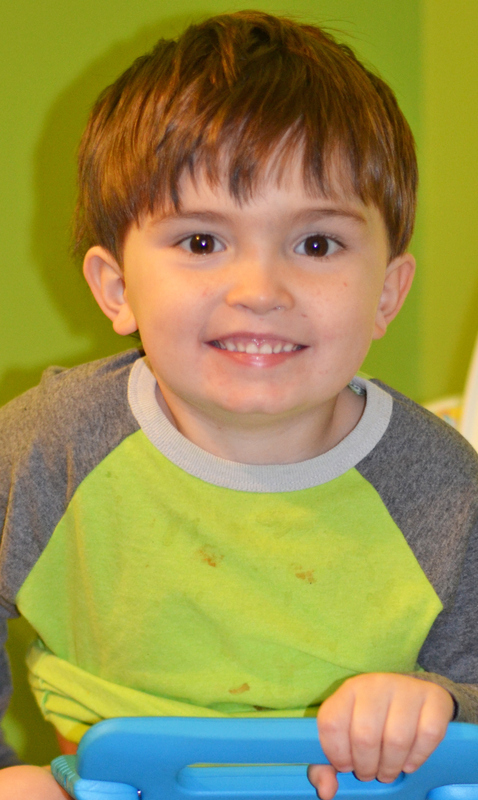 Dr. Wheless and his team, along with the hematologist concluded that Greyson had gone toxic on his Depakote. He was on a high dose at the time and his body had lost its ability to produce white blood cells. This was after they scared us to death with the possibility of his having leukemia and talk of his potential transfer to St. Jude down the street. We had no choice but to stop Grey’s Depakote dosages cold turkey. Those of you who are epilepsy parents will understand that there is a reason that you wean off AEDs – you never quit cold turkey. Once we got Greyson stable after the transfusion and his white blood cell count started to improve, we were able to check him out of the hospital after a week-long stay. Mysteriously, he didn’t seize one time during our stay. This was the first time in two years that he had been seizure-free that long. But the horror was really only just starting. As soon as they stopped the Depakote, Greyson began smiling and laughing again after what seemed like an eternity of being doped up and zoned out from all the medicines. Before we checked out, though, I noticed that he was hyper and not wanting to sleep. He didn’t sleep for five days. Greyson had an experience akin to a drug addict going through withdrawal from heroin. He would scream and cry and want to be picked up and then want to be put down and he would try to climb you like a tree. He ate NOTHING for five solid days, he barely drank anything, and he lost so much weight. It was the absolute most difficult thing that I have ever been through, and it wasn’t even me who was going through it. It was like an alien had taken over my child. His body was literally vibrating. I have never been so scared in my life. No one could tell us what to expect or how long this detoxing process would take, so there was no light at the end of the tunnel. It is difficult to express how horrible this two-week period was on our entire family. On the fifth or sixth day of this hell week, he finally had a popsicle. We all breathed a little sigh of relief that maybe things were getting better. And slowly, he started to want more popsicles and more drinks, acting more and more like himself. We went through three different drugs that week to get him to relax, including Valium, Klonopin, and Risperdone. The Risperdone was just as scary as the withdrawal symptoms, however, causing Grey to drool and seemingly hallucinate. After almost two weeks of hell, his body adjusted to the change. We ended up putting him back on the Depakote at a non-therapeutic dose (less than half of what he was taking previously) just to help with behaviors. As soon as he got that first dose back in his system, he fell asleep. It was like the clouds opened up and we saw the light of heaven. He has not seized since. That seizure-free period has now lasted for 21 months. Every day I think about the next time he will seize. I often have nightmares about it. It is a fear that will never leave your mind when you are a parent of an epileptic child. Any strange movement makes the hairs on the back of your neck stand up with alarm. I am thankful, so thankful, that Greyson has had this respite from the continued seizures plaguing his mind, his growth, and his life. He has turned into a completely different child. He is a person who we feel we are meeting for the first time and we love every second of it. He still struggles with simple tasks like potty training, but the difference between Greyson at four and Greyson at six is 180 degrees. 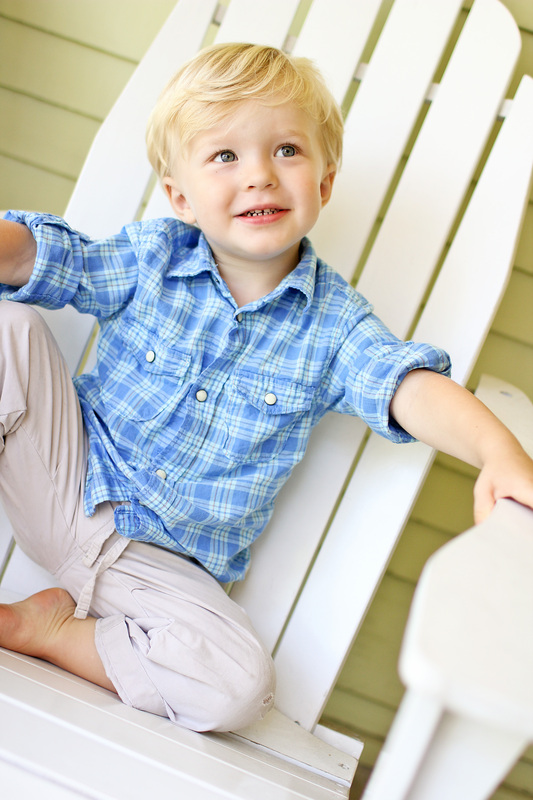 He began to talk at five years old, and he is now learning new words and phrases all the time. What I want new TS parents to know is that there is hope. You should always follow your gut and keep pushing your doctors when you are not getting the answers you want and that you deserve. If your doctor will not be proactive and listen to you, then find another one. I would also encourage TS parents to love your child today – not for what their future will bring, not for what they were before the seizures took over, not for what you imagined they would be – because none of us know what the future will bring. When Greyson was first diagnosed, my best friend said something to me that has stuck with me all this time. She said: “None of us are promised tomorrow. Tomorrow, my child might fall and hit her head on the stoop and be brain damaged.” And, however sinister a thought or remote a possibility that may be, in the end it’s true. We have to appreciate what we have right now, in this moment, because we really don’t know what tomorrow will bring.